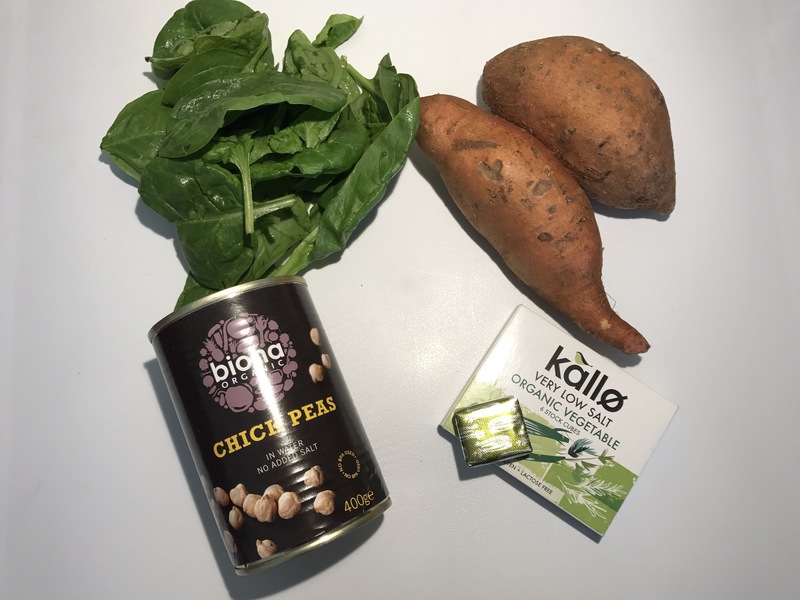 Continuing on with my simple soup series, here is my third soup recipe: Sweet Potato, Chickpea & Spinach Soup. This soup is ridiculously simple, but is so so tasty! I love the natural sweetness in this soup, and although I always feel the need to eat soup with bread, this is one I really enjoy without bread and often have it just with some simple crispy chickpea “croutons” on top. So healthy! Sweet potatoes are an excellent source of Vitamin A (Beta Carotene) which supports the immune system, skin health, eye sight, healthy bone & cell growth and reproductive health. They also provide a good source of Vitamin C, Manganese, Copper, Pantothenic Acid, Vitamin B6 and many others. Although this is also a quick 10-minute soup, it does involve left over already cooked sweet potatoes. Left overs are great for whipping up quick soups the next day and I find it much more exciting to transform leftovers into something new, rather than simply eating them the same way I did the day before. (Optional Chickpea Croutons) Put half of the chickpeas onto a tray or over proof dish and put under the grill to crisp up, shaking every couple of minutes to ensure they crisp up all around. If you have the time, you can make even crispier, yummier chickpea croutons by putting them in a 180 degrees Celcius oven for about 45 minutes, shaking occasionally to ensure crispy on all sides. At the same time, add half the can of chickpeas, and the cooked sweet potato. Break up the sweet potato in the saucepan with a wooden spoon or fork so it heats through quicker. Simmer for a few minutes, then add in the spinach and allow it to wilt for about 30 seconds. Add mixture to a high-speed blender, and blend for about a minute until smooth. Serve with the crispy chickpea croutons on top, or with bread or enjoy as is! Loved this soup.. simple quick easy to make. Very tasty!